Discussion in 'Suits' started by Matt Deckard, Aug 9, 2007. Yes and no. The role of "stylist" was played by the actors' tailors or haberdashers. Eddie Schmidt, a first rate Hollywood tailor, was most definitely Clark Gable's "style mentor," whereas James Oviatt (a haberdasher) was Adolphe Menjou's "fashion savant" for decades. Wide lapels and just a harmony that made his wardrobe iconic. Anywho... Where are our Eddie Schmitt's today? I'm finding out more and will put more up soon... Just want you to know he's the man! After all... who else could dress Gable? Thanks for this thread, Matt! Ah, the great Eddie Schmidt. I have stories about him. Will recount them tonight. In poking around the internet, I found that Eddie Schmdit made the jacket that Spencer Tracy wore in the 1941 movie "Dr. Jekyll and Mr. Hyde." The jacket was sold at auction for $2,500. Here is the description: "A brown twill cut away jacket with single button front closure, buttons at the cuffs and a notched lapel, worn in the film by Tracy. There is an 'Eddie Schmidt, Inc.' label. The jacket was worn through the film as Dr. Jeckyll, both at home and in the lab. Part of the inside lining is torn and missing. Three movie stills are included. From Sotheby's Planet Hollywood Sale, December 2002." Eddie also designed John Wayne's uniform coat in the 1944 movie "Fighting Seabees." According to one book, Gable was a Brooks Brothers man. Yes, Clark Gable was a "Brooks Brothers custom dept." man ... but only after World War II. -- First, you had the "real world" tailors: these were the ones that outfitted actors for their off-camera lives. -- Second, there were the "studio" tailors: they worked at places like "Western Costume Co.," which created the onscreen suits, overcoats, trousers, shirts, sportswear, and period costumes for actors at Paramount Pictures, etc. -- Finally, you had the "two-in-one" tailors: these fellows did not work exclusively for the studios, but instead had their own businesses. A few Hollywood actors (usually the very top ones) would insist that these tailors custom-make practically all of their onscreen clothes and costumes. Eddie Schmidt belonged to the third group. He had a very close working relationship with Clark Gable, the "biggest star in the world" in the late 1930s. Gable trusted only Eddie Schmidt to make his onscreen clothes (with the exception of shirts; Gable had all his onscreen shirts and tunics made by J.T. Beach). Eddie Schmidt enjoyed a long and successful career as tailor to such Hollywood stars as Fred Astaire, John Wayne, Alan Ladd, Gary Cooper, Humphrey Bogart and Spencer Tracy (and their agents! ), but his own star began to wane after World War II, when younger tailors setting up shop in Beverly Hills, Palm Springs and Las Vegas began to compete with him. Schmidt moved to Beverly Hills and partnered with John Galuppo; the business became "Schmidt & Galuppo, Inc."
No longer in existence, alas. I need two of those! Wish that more Loungers would post on this thread. Does anyone else here know about Hollywood tailors/haberdashers "Eddie Schmidt, Inc.", "Oviatt's" , and "MacIntosh Studio Clothes" ... and Hollywood shirtmakers "Machin" and J.T. Beach? Manton? Richstyle? What say you? 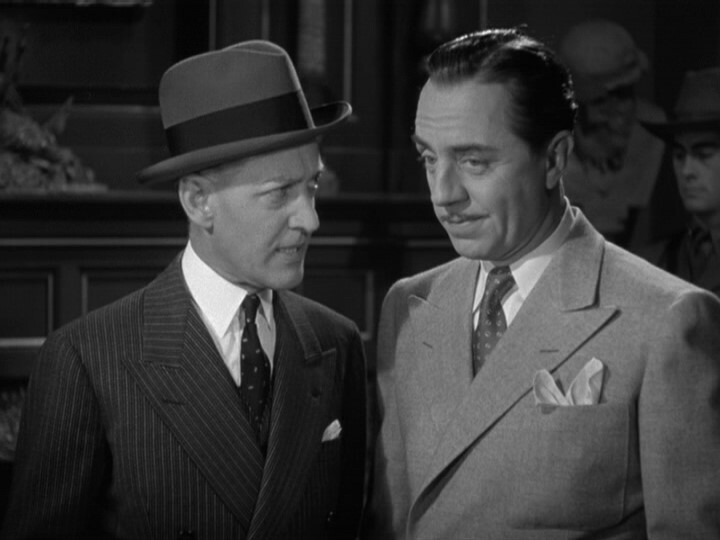 Do we know who made William Powell's exquisite suits? Where else will you find a thread on Eddie? Matt Deckard, BK, Orgetorix, me, and a few other great guys ... we really do love to share our knowledge about vintage mens clothing and history. But I wish that the Lounge were attracting more such "historians/experts/teachers" to it. We seem to have fewer vintage menswear "teachers" now than in the past. It's been a long time since I've learned anything new here about vintage suits, etc. Where are you guys? How can we get you to come over here and post? Teach us, for pete's sake! The archivists at the HRC are digging into files for me as we speak. Really. no Marc, YOU know about those topics. i seriously doubt there are more than a dozen people in the world who know more about the history of 30s clothing than you. don't feel down about it. you should be proud. i seriously doubt there are more than a dozen people in the world who know more about the history of 30s clothing than you. Ahh Marc, I could sit and learn at the foot of your chair for hours. Fascinating stuff. My dream is to grab the (loquacious) ghost of Arnold Gingrich, the founding editor of Apparel Arts and Esquire, and have a mighty fine Q&A.